Dissolved Air Flotation is an ideal process for primary clarification of a variety of industrial wastewater containing suspended solids, colloids, colour and oil and grease. We guarantee TSS of less than 100 ppm and oil and grease less than 10 ppm in the clarified effluents from the DAF system and substantial deduction of colour with use of proper coagulation and flocculation chemistry. Foat cell Sizes 1.2 m to 16. 8 m.
Treatment Capacity (m3/h) 1.5 m3/hr to 415 m3/hr. Dissolved Air Flotation process consists of super saturation of partial flow of clarified water from the system with air from a compressor. The partial flow of approximately 1/3rd of the intake flow is pressurized through a pressure pump to about 6.5 bar which then enters the Air Mixing Tube where it is saturated with air under pressure. The super saturated water steam is then mixed with the waste stream after pressure release. The sudden release of pressure from the saturated stream generates millions of microscopic air bubbles which attach themselves to the contaminants of oil and suspended and colloidal solids in the wastewater, thereby changing their buoyancy and floating them to the surface of the water from where the sludge is skimmed and removed from the water. Maximum Capacity excluding recycle 1250 m3/hr. 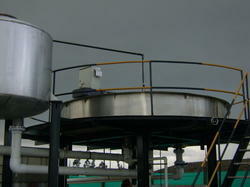 Circular DAF Clarifier of our design has the following advantages compared to conventional rectangular DAF Clarifier. 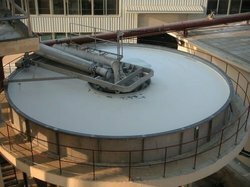 Rectangular DAF Clarifier are generally fixed installations in concrete whereas circular DAF clarifier are fabricated in steel. 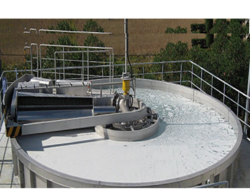 Rectangular DAF Clarifier are generally fixed installations in concrete whereas circular DAF clarifier are fabricated in steel. In rectangular DAF Clarifier the sludge consistency obtainable is limited to 3% whereas in circular DAF of ours it is possible to go even up to 4%. A rectangular DAF clarifier has no inbuilt parts for bottom cleaning whereas the circular DAF of our design has a self cleaning system at the bottom. This eliminates down time for cleaning. Generally speaking rectangular DAF clarifier handle 3 m3/min whereas circular DAF clarifier of ours can handle up to 20 m3/min. Rectangular DAF clarifier has specific clarification capacity of 80 l/min./m2 whereas in our clarifier one could go up to 160 l/min./m2. Compared to the retention time of 20 min. in a rectangular DAF clarifier our circular DAF has a retention as low as 3 mins. which makes the unit exceptionally compact. Max. Capacity Excluding Recycle 1250 m3/hr. Dissolved Air Flotation Systems is a waste water treatment process that clarifies Waste Water containing oils in emulsified form by the removal of suspended matter such as oil or solids. Float Cell Sizes 1.2 m to 16. 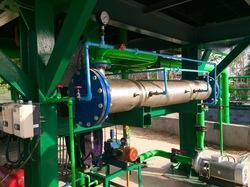 8 m.
Daftech designs and manufactures a complete line of circular daf clarifier. flotation has been widely used for industrial wastewater treatment since 1920. the typical industrial wastes treated by flotation are paper mill backwater, oily wastewater as well as effluents from milk processing, textile processing, tanneries and a variety of other industries. float cells are circular in shape, ranging in diameter from 1.2 m to 16.8 m and flow rate from 5 m3/hr. to 1247 m3/hr. and a liquid depth of only 0.65 m.
daf clarifier are available to process wastewater flows of 5 m3/hr to 1250 m3/hr. utilizing a shallow circular tank approximately 65 cm deep. 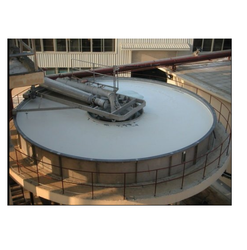 tank diameter ranges from 1.2 m to 16.8 m.
the standard float cell features a polyurethane-coated carbon steel circular tank, tank bottom supports, side wall stiffeners, heavy-duty tank rim, top bridge and catwalk in bigger sizes. units can be fabricated entirely in ss 304 on request. all clarifier feature a standard sludge cone, air mixing tube, central rotary joint, sludge scoop, variable speed geared motors and top bridge with attached assembly. our daf clarifier of 5 m3/hr to 1250 m3/hr. are fabricated in such a way that even the largest unit can be transported in a standard container whereas the smallest daf clarifier of 5 m3/hr. is one singe tank. in higher sizes the daf tank is constructed in segments and assembled at site with gaskets and fasteners.